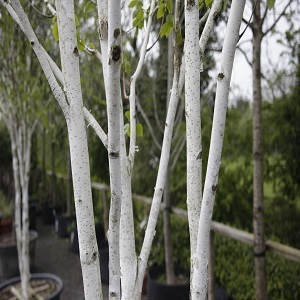 Betula Jaquimontii is one of our best selling trees, this white stemmed Birch is lighter with a lovely shape. this particular specimen has the hugely popular multi stems at a height of 5 metres tall. Plant where the white stems are shown at their best, even illuminate them for a really striking statement. Tags: Betula Jaquimontii, mature trees, multistem trees, specimen trees, white birch.